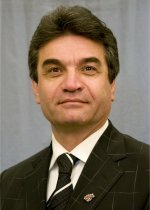 Congratulations to Dr. Hussein Zbib, a Laboratory Fellow at Pacific Northwest National Laboratory and professor of mechanical and materials engineering at Washington State University, on being elected an American Association for the Advancement of Science Fellow. The AAAS is the world's largest general scientific society, and publisher of the journal Science. The AAAS gives the distinction of Fellow to members who have made efforts toward advancing science applications deemed scientifically or socially distinguished. Zbib was recognized for "distinguished contributions to the field of mechanics and materials science and engineering, particularly for multi-scale theoretical modeling and predictions of the thermo-mechanical behavior of advanced nanomaterials." Zbib joined PNNL's Computational Sciences & Mathematics Division under a joint appointment with WSU. Joint appointments provide a method for research organizations to work together on common missions. His research in computational mechanics and materials science focuses on establishing models that can predict the mechanical behavior of materials at small scales (nano-micro-scales) to support development of multiscale models. He also studies the thermo-mechanical behavior of materials, including problems in the theory of dislocation, dislocation dynamics, defects, crystal plasticity and radiation effects. His work also includes mechanics research in damage and fracture, multiscale modeling, plasticity, composites and materials instabilities. He is also a Fellow in the American Society of Mechanical Engineers. He will be honored at the AAAS annual meeting February 18, 2012, in Vancouver, British Columbia.